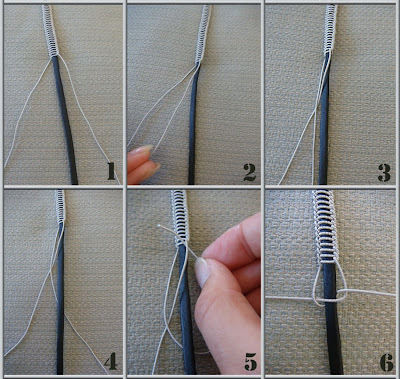 I promised a while back to make a macrame "how to", and here it is. You need a "calf" which is the thread/threads or piece of skin in the middle of the macramé braid (the calf is the thing that determines how long the braid will become) and two strands of wired pewter thread. It's rather hard to tell how much pewter you'll need since it depends on the width of the calf and your technique but a basic guide is to make the pewter threads at least 4 times longer then the calf. Since the macramé braid really want to twirl around it's center you need to straighten it continually during the braiding if you don't want to make for example a necklace where the twisting around the center can be really pretty. Then you just turn the braid over every 8 or so repetitions of steps 1-6.
your bracelets are very nice...i so want to make one myself ..but i can't find the pewter thread anywhere??? where do you get yours??? Hi, I would like to make the piece in your macrame tutorial of August 2009. Could you tell me where to get the pewter thread? Beautiful work! I am also interested in trying this and would like to know where to purchase the thread. I hope you will be willing to share your source. So sorry I haven't replied you guys! I've completely ignored my blog due to work and life demands, but I'm of course more then willing to share! Most of my threads and supplies are bought from http://luletraden.se/ which are an excellent company with really quick shipping, great service and really low prices compared to all else I've been able to find. And the quality of the pewter thread is really good.